Do you do a summer bucket list with your kids? We started the tradition last year! I hand wrote out all the fun things we wanted to do for the summer and we checked them off as we did them. We actually completed almost everything on our list. This year, I created a free printable to share! I plan on having this printed out at Walgreen’s as an 8 x 10 photo. It will go in my frame that is part of my faux mantel. The spring mantel is coming down this weekend, and I am putting up some fun summer accents. 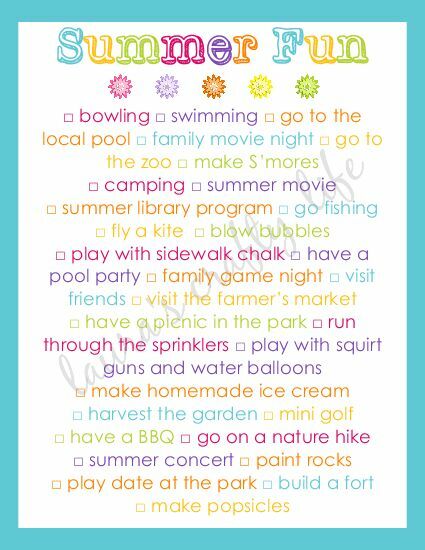 Click below to download your own free high resolution summer fun printable (without the watermark). This printable is for personal use only! Please note: This printable was designed to be printed as an 8 x 10. If you choose to print it at a smaller size, the sides may get cut off, but all the text should print out. What fun things do you have planned for this summer? I would love to hear about it! So cute, Laura! I love how colorful this and that it is full of daily sorts of things that kids would really be able to check off :) My son made his own list, though it includes big vacation sorts of things that we surely won’t be able to do all of! :) Hope you have an awesome weekend! Very cute! It’s so easy to let the summer go by and miss some fabulous must do things. Happy Summer, Laura!